This article will show you how to manage a news column on your webpage. Aside from utilizing the homepage, one of the best ways to promote the club's activities and events is through the News section. The news column feature provides you with an easy way to keep fresh information about your club on your website. You can also add photos on your news column entries. 3. Locate the Manage news heading and click the Select button. 4. Click Add public news to post news on your site. 5. Enter the required information such as headline, news image (if any), date of article, start date of display on the site and the content then click the Add button. 6. If you want to view/edit/delete the news, just select the particular article from the list, click the three dots icon and click the view, edit or delete icon. 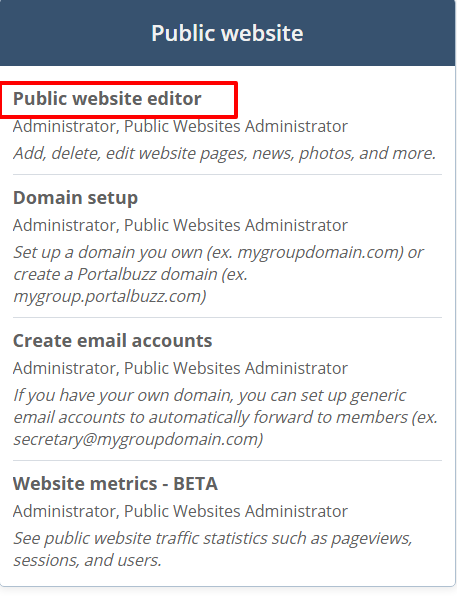 Note: To adjust the number of news entries visible on your webpage, go to Admin tools on the top of the page and locate Adjust template and click the Select button. Go to News Section Look and adjust the News List Limit accordingly. You can also customize the Section Title and sort news either in ascending or descending order by clicking the Sort News Ascending box.